The filmmakers chosen by the Film Development Council of the Philippines to participate in the 1st Sineng Pambansa National Film Festival All Masters Edition are: (from left) Gil Portes, Maryo J. de los Reyes, Romy Suzara, Joel Lamangan, Mel Chionglo, Lore Reyes, Peque Gallaga, Jun Urbano, and Tikoy Aguiluz. 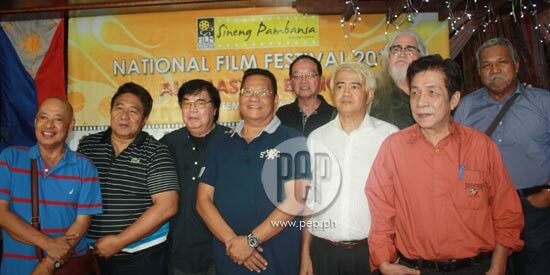 The Film Development Council of the Philippines (FCDP) has gathered veteran filmmakers from Philippine cinema to participate in the first Sineng Pambansa National Film Festival All Masters Edition. Tikoy Aguiluz, Mel Chionglo, Maryo J. de los Reyes, Peque Gallaga, Joel Lamangan, Elwood Perez, Gil Portes, Jose Javier Reyes, Carlos Siguion-Reyna, Chito Roño, Romy Suzara, and Jun Urbano. The 12 participating filmmakers will receive a seed grant of 1.5 million pesos, which represents 40 percent of FDCP’s equity for each entry in the festival. The filmmakers will have to find co-producers to finance the remaining 60 percent of the budget for their respective film projects. Their entries are as follows: Eman (Tikoy Aguiluz), Lorenzita (Mel Chionglo), The River (Maryo J. de los Reyes), Sonata (Peque Gallaga), Lihis (Joel Lamangan), Proserpina de Manila (Elwood Perez), Crossroad (Gil Portes), Oro (Carlos Siguion-Reyna), Badil (Chito Roño), and May Tinik ang Bulaklak (Romy Suzara). Reyes, who was out of the country during the presscon, has yet to announce the title of his project. Jun Urbano also did not give a title for his film, which is based on a children’s story he heard from his late father, Manuel Conde. Gallaga revealed that he will have Lore Reyes as his co-director for this project. FDCP executive director Teodoro Granados told PEP in an exclusive interview that the selection of the 12 veteran directors was done by an internal committee, which includes some of FDCP’s consultants in the film industry. While no specific criteria were followed in choosing the participating filmmakers, all 12 qualified because of their major contributions to Philippine cinema. Granados also revealed that they chose Celso Ad. Castillo to be part of the pioneer batch. Unfortunately, Direk Celso passed away last November 26, 2012. The Sineng Pambansa National Film Festival All Masters Edition will run from September 7 to 16, 2013. The competing films will be screened in SM Cinemas nationwide. According to Granados, an opening night will take place on September 7 at the Mall of Asia where the directors and the cast of their respective films will be presented. Four days after, the festival will culminate with an awards night. OBECTIVE. Putting up the Sineng Pambansa All Masters Edition, said Granados, is an initiative by the FDCP to “improve the quality of filmmaking” in the country. “We are now trying to do this in another way by selecting the masters and getting them to produce stories, similar to what the [young] independent filmmakers are doing… and do it the way they want it, given a limited budget. According to Granados, the FDCP trusts the directors to create quality works thus the film council gives them a “free hand” in selecting their own cast and crew and coming up with their own stories and screenplays. “ALL MASTERS.” Asked about how they feel about the branding of the film festival, several of the filmmakers expressed their view on the “All Masters” tag. Kidding aside, the son of the late actor-director Manuel Conde, admitted, “I don’t think that everybody [here] said they are masters. "I think that we just did our job and nagkataon lang na mas matanda kami dun sa mga bago ngayon. Meanwhile, writer/actress Bibeth Orteza, who represented her husband Carlos Siguion-Reyna who was in Singapore at the time, believes that the “All Masters” label works well for promotion. By “all-thunders,” Orteza alludes to the colloquial gay lingo term for “old” or “tanda” in Tagalog. Gil Portes, whose award-winning films include ‘Merika and Munting Tinig, pointed out where the difference between the veteran and young filmmakers lie. He stated, “It’s all technical! Ang pinag-uusapan, hindi ko maintindihan sa totoo lang. "Maybe, I’m not speaking for the group, I’m speaking for myself. 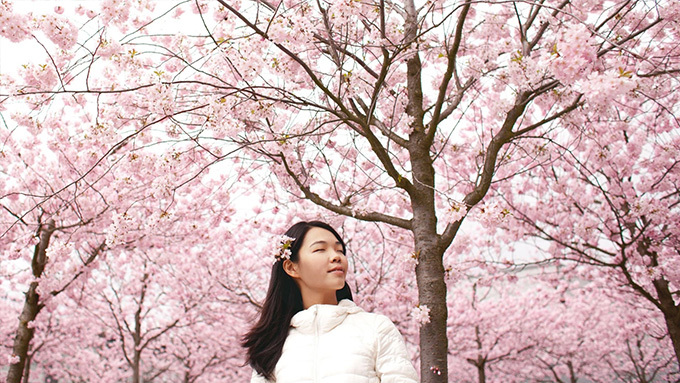 “Ang gusto ko lang ipakita… na we go back to the basics—storytelling. Portes assured that his film and perhaps his colleagues’s film entries in the festival will be “simple” but will “resonate” relevant stories that took place before and take place now. Going back to basic storytelling is their aim. Film and TV director Mario J. de los Reyes, on the one hand, firmly believes that he and his fellow festival participants have been asked to join in the All Masters Edition due to their contribution to Philippine Cinema. “Pinili kami dahil na rin sa aming body of works, sa mga pelikulang ginawa namin dahil nai-prove na rin namin sa buong Pilipinas, sa manonood, na yung mga ginawa naming pelikula rin, ay hindi mo basta puwedeng basta-basta iitsapwera. “Ibig sabihin, bawat isa sa amin, bilang director, has a very good body of work to boast about and to be talked about. Delos Reyes, whose famous works include Bagets and Magnifico, added that while the film festival gives them the freedom to come up with their dream projects, participating requires a great sacrifice on their part. He pointed out, “Kasi to work with a budget of P1.5 million at hahanap ka ng equity no’n, mangungutang ka na naman, it’s not easy. “Dapat iisipin mo, paano mo babayaran yung uutangan mo? Sa tingin mo ba, kikita na naman ‘yan? "It’s just a matter siguro of kung papaano ima-market. Filmmaker Joel Lamangan, meanwhile, reckoned how significant FDCP’s project is: “Bihirang nangyari kailanman na lahat ng nakaupong ito ay nasa iisang proyekto. “Kung inyong pag-aaralan, lahat ng nakaupo dito ay history na, iba’t ibang henerasyon ng paggawa ng pelikula. Famous for his 70 films that include Sidhi, Warat, also The Flor Contemplacion Story, the director said that the audience should utilize the film festival as a study and a review of what Philippine cinema truly is.